Five years after forming the Dimension Data franchise, Doug Ryder talks to VeloNews about the team's accomplishments and shortfalls. More than a decade ago, South African Douglas Ryder forged an ambitious dream: take an African team to the Tour de France, create a system for developing Africans into professional cyclists, and get Africa to embrace the bicycle. More than a decade later, Ryder has achieved much of that dream. His Dimension Data team earned a berth to the 2015 Tour de France and has competed in cycling’s biggest race every year since. And the team-funded charity, the not-for-profit outfit Qhubeka, has donated more than 75,000 bicycles to kids across Africa. One part of Ryder’s dream has proven more challenging to achieve. Dimension Data has advanced multiple African riders to the WorldTour, however, a black African has yet to claim a WorldTour race. The team has also seen various African riders come and go — some are unable to adjust to the rigors of the WorldTour. And the team’s dismal results in 2017 and 2018 — as of press time, the squad had just three wins this season — have sunk Dimension Data to the bottom of the WorldTour standings. VeloNews caught up with Ryder to discuss the various hurdles standing in the way of his project. VeloNews: Your team launched in 2013 with the stated goal of advancing African riders to the Tour de France. Since then you’ve hired a number of riders from across Africa, from Eritrea to South Africa. How is the experiment going? Doug Ryder: I had the big dream. Initially, when we registered as a Pro Continental team, 70 percent of our riders were from the African continent. Now we’re just below 50 percent. Originally, I had said that we would never go below 50 percent of our rider base. That was the original dream, of course. And then you think about the depth and quality that we have, and how hard the WorldTour is. Six years later, I think to myself, ‘Was my plan too ambitious?’ I think so, sadly. Are we going to change our strategy? No. We will have our development team. Look at all of the other big teams that stopped their development teams: BMC, Quick-Step, and others. On my development team, I have 100 percent African riders from Algeria, Morocco, Rwanda, and Eritrea. We’re not losing focus, but sadly the group of riders we initially believed in potentially weren’t the right guys. VN: Why haven’t some of the African riders worked out? DR: Sometimes we get African riders who feel that when they get to our team, they’ve made it. But making it to the team is just the start — then you have to work really hard and win. We had guys who were the pioneers. But there wasn’t always that desire to take the next step forward. Daniel [Teklehaimanot] was that guy for a while and he didn’t go to the next step. He didn’t want to be the total teammate, and cycling is a team sport. You go to a grand tour and you’re only as good as your slowest rider. We had Tsgabu Grmay who rode for us for three years and is now on Trek-Segafredo and is doing really well. He left our team because we didn’t renew his contract. I think that was a wakeup call for him. VN: What other hurdles do you face in working with African cyclists? DR: Africa is a funny place. So many people have come here and taken from Africa. They’ve gone into countries and just got what they wanted and then left. The Africans know this. They can be distrusting of the outsiders. There are cultural differences between each country, of course, but for each it’s quite difficult to gain their trust. We do this through loyalty, even if it means staying with a guy a year or two too long. Some riders just want to earn money and then they are done. I’ve asked them, ‘Do you want this to be a 10-year career? If not, that’s OK, but just tell me.’ I haven’t gotten answers from them. VN: How can you go about overcoming this problem? 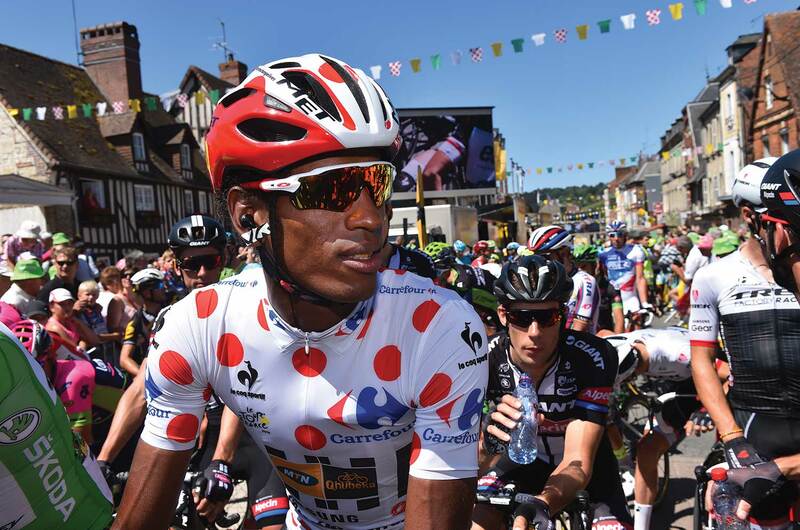 VN: What are the hurdles that African riders face in making the jump to the European peloton? DR: The jump that’s required in technical skills is unbelievable. In Africa the roads are wide and they go on for 100 kilometers in a straight line. In Europe you have 100 riders crammed onto a two-meter wide road and every few kilometers there is a village and twists and turns. There are no major mountain [roads] in Africa, so the descending skills are very behind. Before we went to our first Tour de France we went to a ski resort in Livigno and made them train on the downhills because they would often lose two to three minutes on the descent. Some are not getting the technical skills fast enough. Their power is improving and they’re very strong, but their efficiency within the peloton doesn’t improve fast enough. VN: How has your team tried to help these riders overcome those challenges? DR: You put them into smaller races where they have more of an opportunity to gain that positivity in the peloton and believe in themselves. Unfortunately, the WorldTour doesn’t allow for that. Ultimately, we should probably be a Pro Continental team. We race for the charity, and we’re a good team that works hard and races hard. But the WorldTour ranking is so specific and based only off of WorldTour races. So, we can’t do smaller races like the Tour of Langkawi and have the points count toward our ranking. It would be beneficial for us if the UCI changed that because we could compete in those smaller races for practice. VN: How does the current WorldTour structure impact your team’s goals with African riders? DR: If you look at the WorldTour points, and the points that the African riders have gotten during the season, the results aren’t quite there. We’ve been at it three years, and for the last two seasons, we’ve been at the bottom of the WorldTour rankings. In a year’s time there’s talk of having a relegation system, and if we get relegated, we will potentially lose our sponsorships. And then the team suffers, the charity suffers, and all of African cycling suffers. There are rules that are also directly against our project. For example, if you look at the UCI decision to go from nine riders at grand tours to eight riders. That one spot, that is the spot of the African rider. So now it’s making it even harder for teams like ours to give opportunities to guys who would never normally get it. It’s a privilege to be at the Tour de France. VN: How do you balance the pressure to win with the pressure to give these African riders a chance to prove themselves in WorldTour races? DR: It’s the hardest part. We’ve had a really tough season this year with our star riders crashing. At one point we had 11 riders out. That is catastrophic. So, we had a poor spring classics season. I had a meeting with Dimension Data last week and met with the executives, and they are saying, ‘Where are the wins?’ In the end, I have to care about the sustainability of the team. The charity relies on it, and that is massively why we exist, and why I did this. It’s not window dressing. And then there’s the importance of the ranking and the commercialization and sustainability of the team. I own this team. We don’t have a wealthy backer. I own it 100 percent. I do this because I’m passionate that we can transform cycling and give Africa the opportunity to be seen in the pro peloton. We do belong there. It’s a massive motivation for the kids we give bikes to. When a pro cyclist says I earn a living off of the bicycle, they look at him like he’s mad. VN: What are the success stories coming out of African cycling? DR: We’ve seen a few successes. Certain countries like Eritrea and Rwanda are now leading in terms of the number of pro riders coming through. They’ve embraced the sport. The national federations and governments have gotten behind it. They are really caring and giving. Opportunities are rich for those guys. Our first Rwandan rider won a stage of the U23 Giro d’Italia last year. I look at the African races and I see success. Races like the Tour of Rwanda and the [Tropicale] Amissa Bongo in Gabon are amazing races. You see these strong African teams coming through, and I feel like we’ve helped create hope. People are seeing that there is a bridge that we’ve built. It’s not insurmountable. It’s creating hope for others to follow; I just think that my timeline for what I thought was possible was a little too ambitious. VN: I’ve heard that there are visa problems and travel issues for some African riders. DR: There are visa situations that have popped up in the last 24 months that make it nearly impossible for some of our African riders. Merhawi Kudus was supposed to be at the [Amgen Tour of California] and we couldn’t get him a visa. We tried so many different ways. It’s so discriminatory in terms of how some countries treat Africa. I could get a 10-year visa for the United States and an Eritrean can get a visa for only the days that he’s here. [South African] Nicholas Dlamini couldn’t get a visa for Yorkshire on time. Those are the things that most cycling teams don’t have to deal with. VN: How do you deal with those hurdles? DR: I employ a person who is 100 percent focused on the rider whereabouts and visas. Any sportsperson from Africa is going to have a tough time competing internationally. The whole continent is at a disadvantage, no matter if it’s cycling, football, or track and field. We fly them in and out. We had to register our Continental team as an Italian team, so we could get visas for the riders. You have to find ways to make it work. We want to give these guys opportunities.